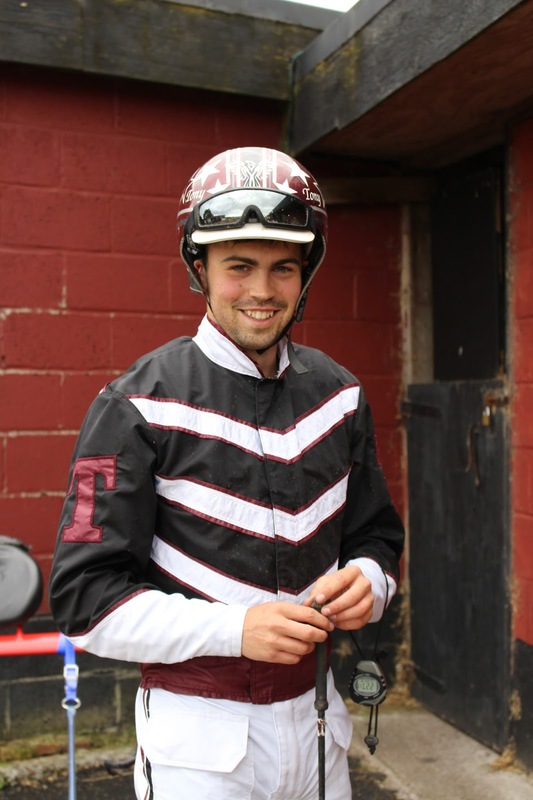 Harness Racing in the UK: An interview with...Tony Allan. Following on from my first interview with Scott Murray, I am now pleased to introduce the other heat and final winner from Friday 29th May, Tony Allan. Tony is one of the 'young guns' of Corbiewood; at 21 he definitely falls into that bracket, but more importantly it's young people like Tony, and indeed Scott (amongst many others) who are the future of this sport not only in Scotland but across the whole of the UK. Tony has had some success this summer with Lyons Pass, a purchase from Ireland, and other horses including Pantihistamine and the newly-acquired American Gigolo. Following his purchase of Brywins Mayhem at Builth Sale last Monday, Tony found himself at the centre of one of the most embarassing debacles seen at Corbiewood when he was singled out by a BHRC official for breaching a rule whereby a horse that was allegedly under his care and entered to race with him as a trainer was not, in fact, located at his premises. I am sure that Tony would have accepted the punishment of not being allowed to race had he been the only person in breach of this rule; however a further four horses entered to race on the same day were also identified to not be under the care of the individuals licensed as their trainers. Unfortunately fairness and integrity did not win on the day and Tony found himself the victim of an inability by a representative of the governing body to apply the rules across the board, as per the Chairman's express views. For anybody who doesn’t know you, how long have you been involved in the sport and where did it all start? My family have owned and trained horses for as long as I know, also with my grandad's family owning and training the great 'Gay Gordon'. Which is the best horse you’ve driven in your career? When I was over in America I had the pleasure of sitting behind 'Dudes The Man' a fair few times. He's shown top form this year by winning The Adios Pace. Over here it has to be Pantihistamine; the handicap system and his age are catching up with him but he was a star for us a couple years ago. (Note: Pantihistamine, aka 'Shane', won a heat of the Matt Turner Memorial on Friday 24th July this year after 40 luckless runs). Which horse, past or present that you haven’t driven, would you like to drive and why? Stoneriggs Mystery. Hands down, I just think it would be great to drive him, to feel first hand what a true champion feels like to drive! Who did, or do, you admire as a driver? Rocker Laidler. I admire how him and Alexis can be so successful both training and driving so many horses year after year. Which is your favourite track in the UK and Ireland? Aberystwyth. Perfect time of year, perfect track, perfect location. Have you driven outside of the UK and Ireland? If not, where in the world would you choose to drive? Would love to be able to drive in America in the future, just a different ball game over there! Have you ever considered moving abroad to become a professional driver? Hopefully in the future I can eventually move to America and work with horses over there. Do you any plans to return to America this coming winter to work? Hopefully, as long as I can get things sorted for it. If you could change one thing about the sport in the UK, what would it be? The outside perspective of harness racing of those not involved in the sport, I think it puts off many from coming to even spectate. Name one thing that you would NOT change. The atmosphere that's generated in a good finish to a race in a few tracks in the UK, the crowd getting involved, which isn't really that common in the U.S. and Canada. Which is your favourite meeting in the UK racing calendar? The Aberystwyth weekend in July. How much do you consider information from a trainer when you drive? On horses you haven't sat on before, I feel it's best to at least take into consideration what information you're told about the horse, before you make your own decisions. Out of all the races you have won, which has been the most memorable? Which race would you like to win that you haven’t already? 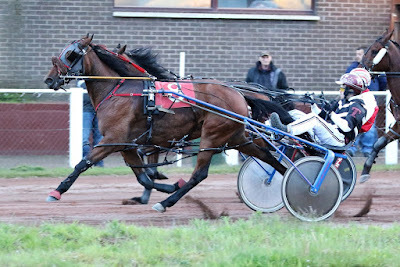 Probably winning heat and final on Naughty Nellie (Friday 24th July), I had never driven the horse and had never won a final before so I was really happy to win the final both for myself and the owners Caroline and Plute Kennedy. I would love to win a race at Musselburgh if the meeting races again. How would you describe your driving style? i.e. pace setter, strong closer, rail hugger? Not entirely sure to be honest, got a few horses who prefer different driving styles. If I'm honest I'd probably say I'm more of a pacesetter. Where do you see yourself in the sport 10 years from now? Hopefully as an A Class driver. What do you do for a living, seeing as driving isn’t your full time occupation? I was working in retail until I went on a working trip to America over the winter. I'm currently training a few horses and occasionally working doing landscaping. What are your hobbies/interests outside of racing? Football. I try to play as much as I can but I don't have much time with doing all the horses! If you could visit one place in the world, where would it be and why? Probably Rome, not sure why but it's been somewhere I'd like to visit for a while. You’re stranded on a desert island – what five things can’t you live without? You’re holding a dinner party for five famous guests (alive or dead) – who would they be and why? Frank Sinatra, Stanley Dancer, Kevin Hart, Steve Carell , Jennifer Aniston . A mix of of beauty, humour, class and knowledge. Probably tapping people on the shoulder to get a laugh! If you won the lottery, what would be the first thing you would spend your winnings on? Can't lie, probably move to America and buy a load of yearlings. Probably the other day from my sister, for leaving the house in a mess. Common occurrence. (Note: since this interview took place, Tony has fallen foul of an inconsistently-applied rule as mentioned above. Which cannot be said for numerous others who were also breaking the same rule). 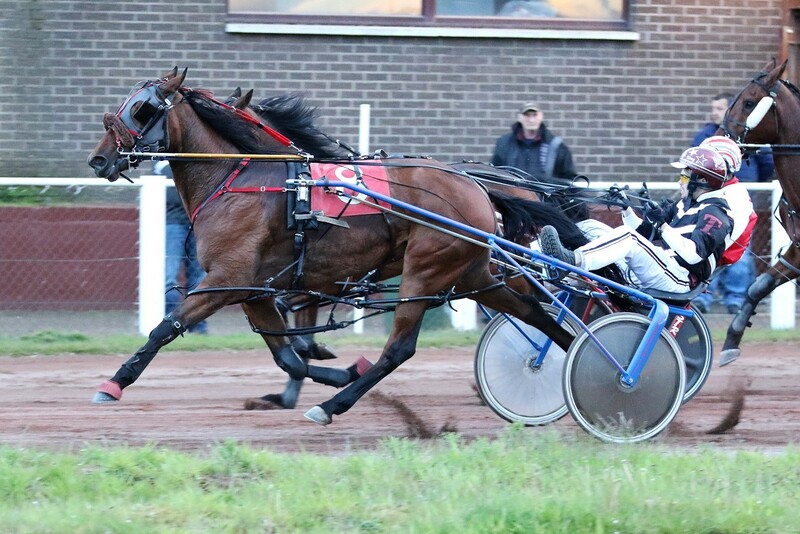 Tony driving Naughty Nellie in her low grade final win at Corbiewood, 29th May 2015. Thank you to Tony Allan for spending his time answering the questions above. I'd like to wish him all the best for the last meeting of the season and for next season, both with his own horses and the drives he picks up along the way. We really need to practice our duet ready for the next karaoke session at Corbiewood young man! Going out on a high!